From the Pinelands to the Highlands, New Jersey's natural landscape is varied and beautiful. Regrettably, it is being paved over at the alarming rate of 50 acres a day. NJFIT encourages transportation networks that preserve open space and the redevelopment and revitalization of existing urban and suburban centers. 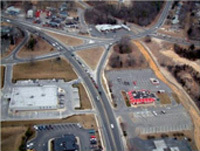 Sprawling land use patterns along Route 9 in Ocean County are inefficient and ugly. development can be built close together. This means more farmland and environmentally sensitive land can be protected for future generations. However, development tends to be of a lower density where driving is the primary means of transportation. Houses, office and retail are spread farther apart and new construction spreads out more quickly into the countryside. Research indicates that driving can be reduced by more than 30 percent by simply doubling land use density by bringing destinations closer. Studies have also shown that widened or extended highways encourage the construction of new, low-density, car-dependent developments at the urban edge. This increases congestion on our highways because everyone needs to drive everywhere. NJFIT directs new development toward older, existing communities. This saves approximately 122,000 acres of land from development (New Jersey State Development and Redevelopment Plan 2001). This policy is not only financially sound but it also protects environmentally sensitive land at the urban edge and reduces the number of cars on the road. NJFIT encourages communities, developers and other stakeholders to communicate and coordinate land use and transportation plans. Sensible land use partially depends on making the most of what we already have, instead of always building new. In fact, fixing existing infrastructure is more affordable than building additional facilities. Directing resources to already developed areas can also help revitalize older neighborhoods and generate significant economic development for the region. Walkable, bikeable, transit-oriented downtowns increase productivity, create a high "quality-of-place," strengthen land values and increase property tax revenues for municipalities. Making these improvements in existing communities can reduce the pressure for new development at the urban edge and ultimately preserve open space. One study estimated that New Jersey could save more than $2 billion, or 15 percent, in road and water/sewer infrastructure between 2000 and 2020 by adopting the New Jersey State Development and Redevelopment Plan, which focuses development in already built areas. Sensible Land Use and Sustainability FITness goal is listed below in the drop down boxes. Achieving this goal is possible through the application of various tools and programs.